If you drive from Dillon, the most convenient way is to get to Copper Mountain and from there take US 24, which leads to Leadville, then Salida/Poncha Springs. That is where the two forks converge, and now you have to cross the Monarch Pass, famous for the ski area Monarch, which boasts insane amounts of snow. That’s mostly because it snows all the time there, so I focused my attention on the weather forecast for that place. After Monarch, you follow several streams and rivers until you hit the very pretty town of Gunnison. There you turn right and drive up a canyon that ultimately leads to Crested Butte. That’s a little, magical town that leads to Crested Butte Resort, our final destination. I had driven to Copper Mountain all winter long, so that very short part of the drive was not surprising – although I still love the views of the Gore and Tenmile ranges, and the valley of Tenmile Creek leading to the mountain. Copper came into view and I wondered whether we should stop, but decided against it. The weather forecast said it was going to snow heavily in the late afternoon, and I sure didn’t want to drive through driving snow (is there capital punishment for bad puns, yet?). After the turnoff and after passing the free Alpine Lot, it was all new to me. I had looked at the maps a hundred times, but I didn’t really know what to expect. I wasn’t disappointed: the initial part of the drive was spectacular, moving from a deep alpine forest to open expanses above tree line, finally reaching a plateau from which you could see an enormous bowl of pure white snow in the distance, and a mine that looked straight out of a James Bond movie. It’s a molybdenum mine that is still very profitable, marking the state as one of the bastions of rare metal ores. After the mine things went downhill. Literally: there was a series of switchbacks leading into a valley. That’s the headwaters of the Arkansas River – the same river that flows (surprisingly?) through Arkansas. Right there, the little town of Leadville. In the annals of geography, Leadville is notable for being the highest incorporated city in the United States. History is less dry and more colorful. Leadville came by its name thanks to the element lead, but as usually the case with lead deposits, the real value was in the silver contained in it. Leadville became rich on that stuff, especially after a law was passed requiring the Federal Government to buy it (Sherman Silver Purchase Act). The boom was short-lived, and three years later the law was repealed and Leadville entered a deep slumber. Which is great for tourists, because now the town looks like it was dropped from the sky in 1890 and never changed. Downtown even has an opera house (the Tabor Opera) that was gifted by Horace Tabor, one of the most curious characters in Colorado history. Another famous resident was JJ Brown, whose wife Molly received world-wide fame when she went on a cruise on a brand new ship called RMS Titanic and survived, becoming a hero when she convinced the crew of her lifeboat to return to the site of the sinking to look for survivors. Leadville, for all its charm, never manages to fully capture your attention. There is something else in its backyard – or rather, the town is in this something else’s backyard. I am talking about Mount Massive, a monster of a massif that extends as far as the eye can see to the West of town. We were lucky and there were no clouds hovering above it. It’s not just that the mountain is massive as the name implies, it’s that it rises from the valley floor as if it were flying above it. Despite the crappy snow season, the many peaks were sparkling in white, making me lust for a helicopter and a day of heli-boarding. Immediately to the South of Mount Massive is another tall mountain. Mount Elbert was covered in clouds when we got there, but it has the singular distinction of being the tallest mountain in Colorado. It’s really just a few feet taller than Massive and much smaller from the perspective of footprint, so it’s easy to understand that partisans of Massive tried to pile up rocks on their preferred summit to compensate for the difference of 12 feet. Imagine that, the two mountains are both well above 14,000 feet, and yet they are only 12 foot apart in absolute height. After Massive and Elbert, the chain of mountains to the West continues unbroken and majestic. The peaks South of there are called Collegiate Peaks, because many of them have the names of famous universities. Harvard it the tallest of them, just 7 feet shorter than Massive and thus the third-highest mountain in Colorado. There are also Oxford, Yale, and Princeton, of course, with (Mount) Yale dominating the first town South of Leadville, Buena Vista. We stopped at the Safeway there and were surprised at the friendliness of the staff, which guided us through the store as if they worried we might get lost. The landscape from there on is simply gorgeous. The Arkansas Valley is lush and rich, with the river itself providing plenty opportunities for recreation. Plenty of signs inform about river rafting, kayaking, and fishing outfits. Something to check out on one of those long summer weeks when life in Denver is unbearable. Towards the end of the valley, the river turns South-East and reaches the town of Salida, which is apparently now an artist community. It was born out of some practical utility, as a railroad stop. But we didn’t see it (despite it being worth a visit, and despite the detour only taking 8 miles or so). I needed to get over the pass. In Poncha Springs, we turned right/West. The highway made me grin, since it’s the same US 50 that got me so many, many times from Sacramento to South Lake Tahoe. Here, it’s about the same as there: mostly two lanes, occasionally complemented by a passing lane, only doubling up when it’s flat. As soon as we hit the slope, it started snowing. It wasn’t bad at first, but it turned more and more into a blizzard. The car ahead of us was a crappy purple Scion (in reality it was blue, but I liked the reference) and it had the worst time moving forward. We were crawling up the slope, almost stopping at every hairpin turn. Finally, we reached the resort, which was covered in clouds and hence as good as invisible. After the resort, one more hairpin turn and we reached the pass. From there on, it was easier to drive – the snow was less dense and the clouds were finally parting. As we got down to the valley floor, we found ourselves back in the spring. There was no meaningful snow to be seen anywhere, and we soon got to the very pretty valley of a meandering stream called Tomichi Creek. Now things started getting a little dull, until we hit a cemetery and immediately thereafter another pretty town, Gunnison. This is the location of Western State Colorado University, which makes the town richer and more cosmopolitan than its remote location in the middle of nowhere would indicate. Still, not there. We turned right on Main Street to see a passable approximation of “tourists meet Western town”. More breweries per mile than in Downtown Denver, but also feed and fishing stores. From there, another long drive along the Gunnison River, which flows to the North and West of town. To the West, it will eventually enter an enormous chasm at Black Canyon of the Gunnison National Monument, which I look forward to seeing. To the North, it becomes decreasingly a river, more a creek, and again kayaking and rafting opportunities abound. Eventually, you see a trillion (maybe four dozen) mansions splattered on a hillside, which we took to be the resort. It’s just a satellite called Crested Butte South. But soon after it, you could see the butte to the right, and a town to the left. You drive through town, cutting to the right just short of the downtown area, and head up an oddly named Gothic Road (turns out there is a mountain called Gothic Peak, and the road eventually leads to it). There, we hit the hotel. It was the Elevation, which has a spa (not used, should have) and really nice rooms. It was early afternoon and we decided to see town. I could have gone boarding, but I didn’t want to leave C alone (who knows the mischief he could have concocted!). So the two of us took the shuttle (it was snowing and I didn’t want to drive) that takes you to town. On the map, I had thought of the setup as weird. Unlike most ski resorts, that are either purely a resort (Keystone, Squaw) or a town with ski lifts (Breckenridge, Aspen), Crested Butte had separated the two, but put them right next to each other. From the hotel to downtown it was just 7 minutes or 2.6 miles. We hopped on the shuttle and got out before even exchanging a single sentence. Crested Butte is special. It’s colored by all the money from tourism and looks in parts like a tourist town. Lots of restaurants and businesses catering to skiers, t-shirts everywhere and the usual assortment of tchotchkes. But as soon as you leave the main drag (Elk Avenue) you are back to an overpriced hippie commune. We talked with a few of the locals (check out the mining museum, it’s really neat and the lady that works there is full of information and insight) and they all emphasize how different the place was 50 years ago. People came to Crested Butte to leave the world. Indeed, it’s still a trek to get there – only it’s a trek that a lot of people make. AirBnB seems to be increasingly popular in town, especially outside of ski season. We didn’t find anything during spring break, but definitely worth checking out. We tried all restaurants and couldn’t settle on anything. C had read the name of a restaurant and decided he wanted soup, but it turned out to be a French restaurant named Soupcon that didn’t serve any soup but onion. So we took the shuttle back up after having spent hours going from store to store and hundreds of dollars collecting T-shirts and stickers for computer cases. While the town is charming, the resort is a bit of a letdown. We tried to get food at the only decent eatery we could find, the Avalanche Grill, but the wait was infernal. We settled on the bakery on the ski hill, which turned out to be a real bakery that served nothing but baked goods and coffee. They had amazing views from their balcony and could have done great business, but unfortunately the goods were not too exciting (my cinnamon roll was definitely underbaked) and the owner/manager came out to shoo away people that had brought their food from downstairs, where there is a burger joint. Google told us there were better food options. One stood out in particular, The Divvy. It had a perfect 5 star rating and was just a few steps away. We went where Google wanted us to go but found only a hotel grill that was closed. What to do? In the evening, we finally found The Divvy. It is located in the little plaza behind The Lodge, near the lifts. It was late – for them – but we still went in and were very, very happy we did: the service was absolutely outstanding, the food delicious (try the green chili), and the ambiance just the right vibe of relaxed. Other options were not stellar. The next day, C wanted to try the Mexican place (El Jefe) and it was overpriced and not too exciting, just as the reviews announced. We decided to forego the hotel restaurant, which would have been an amazing option, but the reviews trashed it. Finally, we tried the patio at Butte 66 with amazing views of the lifts and mountain, but there was also a long line there. The hotel, Elevation, was right next to the lifts and had its own rental and gift shop. It also had a small pool and a huge hot tub, along with a sauna and a promised steam room nobody could find. The rooms were very nice, with a mini-kitchen that included coffee maker, microwave, and a mini fridge (or, as I call it, a full kitchen). It was morning. C, despite being an avid snowboarder, is a beginner. 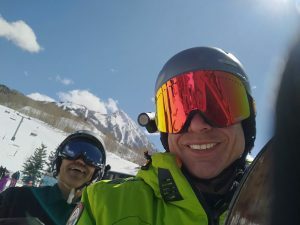 Since it was powder day and since he wouldn’t have been able to board all day long anyway, he gave me an hour to slice the pow while he putzed around with his rental and we’d meet then. I was giddy with excitement: the main lift (Silver Queen) started slow, but quickly turned into a vertical grinding machine. You could see it hit almost the summit and could see the steep gullies and couloirs radiating to its right side. I wanted up! RMSP is really great: you don’t have to go to the ticket window (like with Mountain Collective) and wait forever to get your pass. You simply go to the lifts and you are good to go. Sadly, they don’t have RFID scanners, so you have to get the pass out every time you hit the main lifts. But that was no price to pay. I headed up Silver Queen and was amazed at the resort. Sadly, the couloirs were a little barren and the idea of scraping my board on Colorado bedrock didn’t sound appealing. But the the left there was plenty snow in wide ribbons converging back at the bottom. I hopped off and shot down. Everybody else turned right to hit the blues and the North side of the mountain, but I had seen smoothness and I wanted it. A year in Colorado has made me miss clean powder, our mountains tend to get crowded early and you really have to rush to have first tracks anywhere. The main line back to Silver Queen is called International. It was FUN!. Half of it was that the slope was pretty gnarly at times, but the other half was an unbroken sheet of six inches of pure powder that needed to be brought to life. I sailed down like a maniac, unable to see ahead because of my own wake that kept spraying back and fogging up my goggles. I don’t think I stopped even once, hitting the bottom in a mad rush, trying to get to know the mountain before I had to meet up with C.
Down at the bottom, I realized if I wanted to see more, I had to rush away from the lift. C would not be able to do run after run, and he probably would release me for a quick jaunt while he was resting. So this front side by the main lifts I could keep for later. Now was the time to get as far away as I could muster. I looked at the map and decided Paradise Bowl, the North side, was where it was happening. I got to the top, turned right instead of left, and descended. Sadly, everybody else seems to have decided to do the same and there was barely a trace of powder available. Most of the terrain was already skied out and while the bowl looked fun, the snow was sad. I perused the map again. There was another express lift that seemed to fit my bill: East River Express. Sounded a little New Yawk, but it turns out the stream that flows North of the butte is called East River, too. 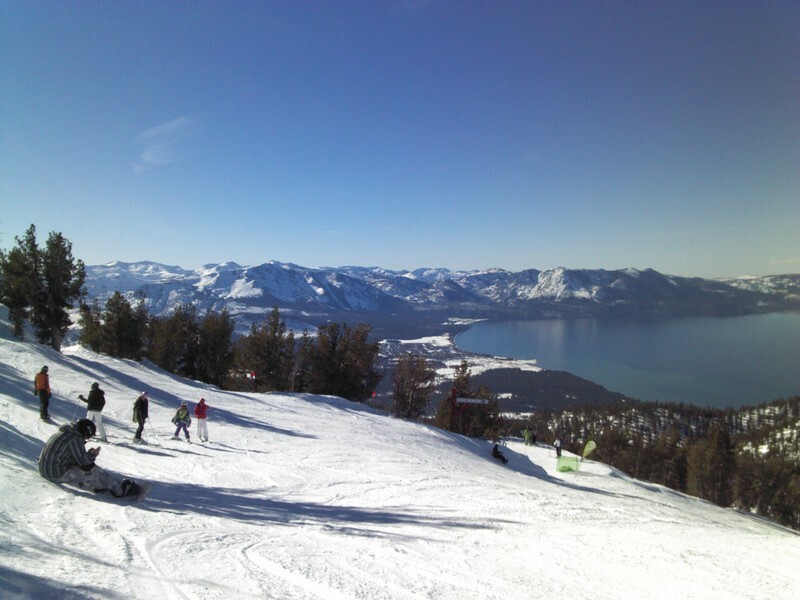 I headed there from Paradise Bowl and – my oh my! The snow was largely untouched and there were plenty options available. To the far left and right, wide open groomers. At the center, wave upon wave of giant moguls fluffied up by the new powder. I traipsed through it. It was heaven. I hit the groomers, hit the trees, hit the moguls. Not a lot of people around and no lines at all. The lift ran in an eternal unbroken circle, delivering me quickly to the top. No social life for me, since I was by myself and there was nobody to share the lift with, but coming down was a blast! There is more challenging terrain in CB, but most of it is only accessible via slow lift, T-bar (yuck), or a hike. I didn’t have the time, but the bowls that covered the far North side of the mountain looked spectacular, challenging, and fun. In fact, I was eying one of the lines when I got a message: C was bored and wanted to see me. It was barely 10, and I had had less than an hour of snow time, but I had done more vertical than I hoped. I met C at the bunny slope. We did a series of descents and he did fine, so we graduated to the green runs. Interestingly, the entire lower part of the mountain is classified green, including the entirety of the terrain served by the lift right next to Silver Queen, called Red Lady. I would call them good greens, in that they don’t have those long flat stretches that are the bane of any beginner snowboarder (particularly helpful because they are the lower part of all runs that go down the front side). The runs continued being uncrowded, despite more of a line at the bottom (Silver Queen also had a line by now). We did one run and I disappeared for a quick jaunt down International or about there. After a few runs, I realized that C had reached the point where he should be coming down blue runs: the steep parts of the green didn’t freak him out, and the flat parts were becoming his real challenge. We went to Westwall, the far Southern lift that seem to be there just so that the Saint Moritz condos can claim to be ski-in, ski-out. The lift serves a single, ultra-wide run, Buckley, that is blue only in the imagination of a beginner. But it was fun to ride, especially because the snow was good. C did his best and did well. I was starting to be sad because the day had turned sunny and warm and the snow was suffering. There was still plenty left untouched at Westwall, but none of it was better than slush. We only had the room for one night (at the price, absolutely no more rest for the wicked) so we had to leave as soon as we were done with the mountain. The good thing about March is that the evenings are long again and we would drive mostly during daylight hours. Leaving CB was easy. Easier than getting there, on account of the warm weather and the sunshine. We headed back, stopping in Gunnison for gas (despite the car being half full, still). We reached Monarch Pass and finally got to see the resort – gorgeously nestled in a bowl along the top of the ridge. Poncha Springs and traffic along US 285. At Johnson Village, the roads split. We took the US 285 side that would lead us up the valley of Trout Creek to one of the four high alpine valleys in Colorado. Since early Coloradans were not very creative, they simply named these valleys, parks and we would find ourselves in South Park. The landscape is amazing. There is this enormous valley ringed by mountains on all sides. Grasses grow in large meadows where meandering streams seem to mostly focus on being pretty. At the very beginning of South Park, the road forks. 285 will get us into the Denver Basin, while US 24 heads straight for Pikes Peak and Colorado Springs. At Fairplay, a road leads along the Blue River to Breckenridge. Many South Denverites prefer this route to the ski resort, because it avoids the notoriously jam-prone interstate. Little hamlets, grasses, streams. The shadows were becoming longer and longer, the guard rails casting over the median line. Finally, the endless stretches or straight road end and a 90 degree turn signals an ascent. Soon, we land in the valley of the North Fork of the South Platte River, which will eventually form the West side of Downtown Denver. From now on, the landscape is mountain valley. The far views of South Park are replaced by increasingly urbanized hillsides. Soon we hit Bailey, then Pine, finally Conifer and Aspen Park, who for all intents and purposes are satellite suburbs of South Denver. The highway becomes wider, turns into a freeway. Out of nowhere appear the Great Plains, and when we drive through the Dakota Hogback, to the left a quick glimpse of Red Rocks. We are home.